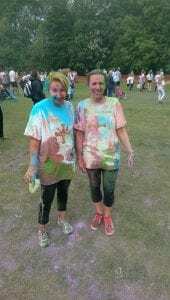 The team at Riley Langdon Solicitors have just sponsored our newest member, Rebecca Hinds, to complete the St Cuthbert’s Hospice Colourama. Rebecca jumped, dived and crawled through 5Km of obstacles to reach the finish line, whilst being covered from head to toe in powder paint! She crawled through cargo nets, tackled a giant spider’s web and skidded on the slip-slide to the finish line. Rebecca raised an excellent amount of money for the hospice and we would like to offer her our congratulations. Well Done Rebecca!! We’ll have you doing the Great North Run in no time!